Collaborative. Strategic. Now that's brilliant. This City has a population of over 250,000 and is home to a large airport and a number of major corporations. The City needed a solution that was flexible, easy to use, and provided one system and access point for all budget data. Questica Budget was determined to the be the friendliest, most easily configurable solution. 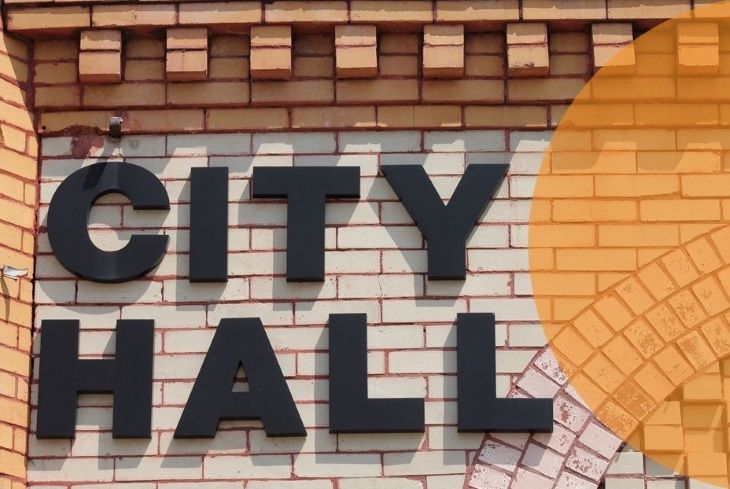 The City needed a solution for their operating and capital budgeting needs that was flexible, easy to use and provided one system and access point for all budget data. Reporting was also critical – the ability to create the many complex reports that were required, in a simple manner, and ensured accuracy of data. Budget preparation is an 11-month process that begins in February and continues until the budget is approved by Council in December. A four-year operating budget and a 10-year capital project budget are prepared for the City’s numerous Service Areas. Preparation of budget requests for new initiatives and the update of existing base budgets are the two main processes. Creating the budget involved the use of SAP, BI (Business Intelligence), InfoPath, and numerous Excel spreadsheets. Each Service Area developed their own budgets using many tools and processes. As a result, the budgets for capital, operating, labour and reserve and reserve fund balances were captured in separate locations leading to a disconnected process. 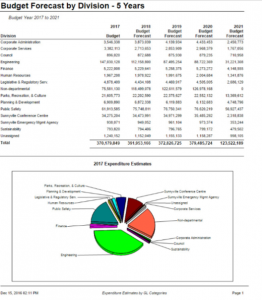 Multiple manual spreadsheets were created by the City’s Financial Analysts to capture their area’s unique budget information. This information then had to be entered manually into tables for the Budget Book, increasing the risk of errors. There was no unified system to run high level reports. The Service Area leads had to use Infopath and Word documents to add the business planning information to their area’s budget requests. It was difficult to keep the budget information, in multiple databases, current and accurate. The City needed to identify a system that addressed its budget needs. Questica Budget was determined to be a user-friendly, configurable solution. It was also chosen because it offered an ad-hoc reporting solution and the ability to capture labour budget data. One location for all budget preparation eliminates any version confusion and ensures a high degree of accuracy. The ability to run reports and different scenarios increases the ability to understand the impact of budget decisions on the operating, capital and labour budgets. The ability to import and export budget data allows Financial Analysts to spend more time on the analysis of the data and decreases the probability of keying errors. It is also possible for the Database Administrator to import and export master data quickly. It used to take up to two weeks to get their reserve and reserve fund information compiled and with Questica Budget, it can now be accomplished more quickly. Salary budgeting is such a significant portion of any budget. With Questica Budget, Canada Pension Plan (CPP) changes and other benefit updates are in the one system. Running different “what-if” scenarios for increases (1% vs. 2% increase, etc.) is straightforward and the impact of each scenario is immediately understood. The City implemented new reports last year that captured FTE’s (Full Time Equivalents) in each cost center, and Service Area, which has improved reporting efficiencies. The City Business Planning and Budget Book includes each approved budget request and many tables from the Service Area Groups. With Questica Budget, this data is populated directly from the budget system with the click of a button, reducing the time required and ensuring accuracy of the data. Report functionality within Salaries has been a huge benefit. The City is now using a Salaries report that captures full-time and part-time employees, within each Cost Center/Service Area. Financial Analysts are now able to proactively track and manage their Service Area budgets. The City manages many reserves and reserve funds. Forecasting for these reserves was challenging. The City and Questica could easily provide a solution to capture and report for reserve continuity according to the City’s process. Questica Budget makes the budget accessible to everyone involved in the budget process, but provides the ability to lock the budget down as it moves through the budget process, controlling access to it and ensuring only authorized personnel can make changes to it. The support from the Questica staff through and post implementation has been great. The team has been very responsive and has worked to resolve any issues as quickly as possible. Thanks to more efficient budgeting, Ontario City is brilliant.